Confirmed. Sign up for the Certification Course or request a quote. The instructor will be Brian Simelane, Certified GrowthWheel Instructor in Africa. Brian is the GrowthWheel Framework course Instructor across Africa. 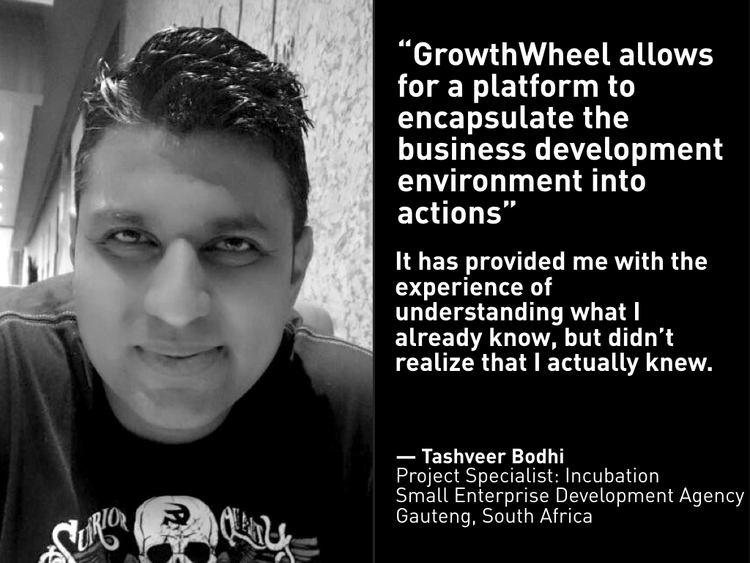 Since 2017 Brian has trained and certified more than 100 x GrowthWheel Business Advisors, Mentors, Incubator Managers, SBDC Managers, Enterprise Development Practitioners and Entrepreneurship Educators across Africa. He is an Edupreneur with a passion for teaching business models, financial management, and modern business tools through the use of Simulations and other experiential learning tools. Brian is one of few Business Simulation Experts in Africa, is also a Director & Lecturer at Learning Sims - Lecturing MBA, Business, Enterprise Development and Social Entrepreneurship at several Universities that includes Wits, GIBS, and USB. Brian has an honors in Accounting and Commerce and lived and worked in several Countries which includes USA, Russia, to mention a few. He holds an Advanced Toastmaster Bronze Award and regularly work as an International Speaker. He also has interest in gamification and the use of experiential learning tools to improve retention of knowledge and drive improved business results.